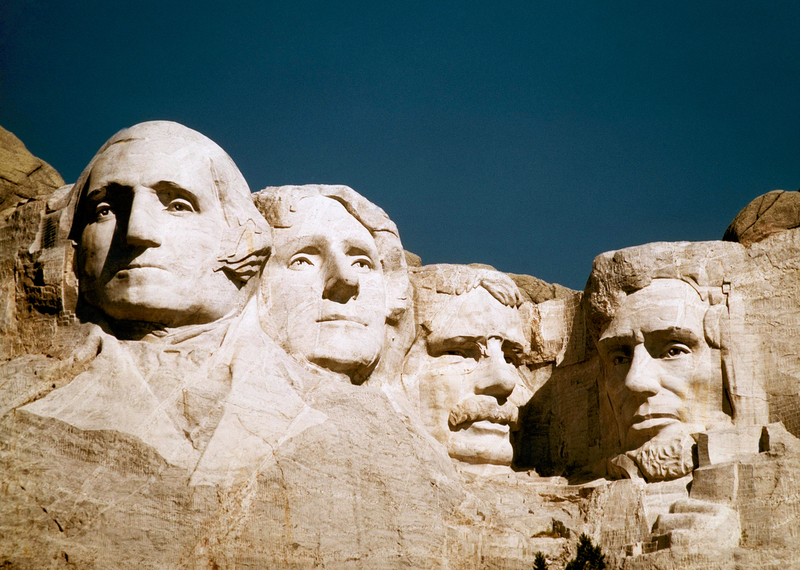 Move Over Mount Rushmore, There's Another Club Of Presidents : The Two-Way President Obama's visit to South Dakota will allow him to brag that he has set foot in each of the 50 states — only three other U.S. presidents can make that claim. The statues of George Washington, Thomas Jefferson, Teddy Roosevelt and Abraham Lincoln at Mount Rushmore in South Dakota. President Obama is accomplishing something today that few of his predecessors can claim. He's going to South Dakota — and his visit will allow him to brag that he has now set foot in each of the 50 states. In fact, only three U.S. presidents can make that claim: Richard Nixon, George H.W. Bush and Bill Clinton. Obama will be delivering the commencement address at Lake Area Technical Institute in Watertown. As the Sioux Falls Argus Leader reports, the town of 20,000 is all abuzz over the president's trip, and is even making some infrastructure improvements. State transit workers cleaned and repainted any roads the president's cars might use, including Highway 20, the newspaper says. Actually, this won't be Obama's first visit to South Dakota. He went to the Mount Rushmore State during his 2008 campaign, including a stop at the world-famous Mitchell Corn Palace. But he's never been there as president. "We are the warmest of the Dakotas, we have Mt. Rushmoore (sic), and when I just go to the park, I sometimes see hawks, coyotes and bald eagles. Please visit us soon." The Washington Post, meanwhile, reports that official White House photographer Pete Souza is already commemorating the president's full 50, and has posted a photo gallery of his stops ... with one space left blank.